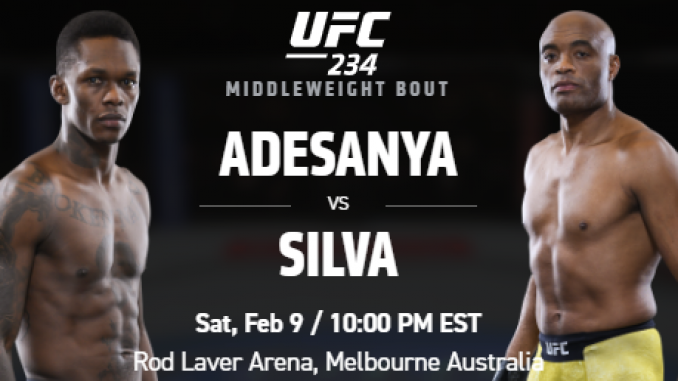 John Pollock's coverage of UFC 234 from the Rod Laver Arena in Melbourne with a new main event featuring Anderson Silva taking on Israel Adesanya. Welcome to our coverage of UFC 234 from the Rod Laver Arena in Melbourne, Australia. If you missed it, UFC middleweight champion Robert Whittaker is off the card after he complained of abdomen pain, was taken to the hospital and diagnosed with a hernia that required surgery. Kelvin Gastelum will not receive a new opponent on short notice. The new main event is a three-round bout between Anderson Silva and Israel Adesanya. Jon Anik and Dominick Cruz are on the call tonight. Buren started off each round with a takedown and had some strong positions but always lost them as Martinez was patient and was comfortable grappling to get control on the ground. On the feet, Martinez controlled the striking through his ability to back up and connect. In the final round, Martinez escaped the mount to take Buren’s back and later secure his own mount. He ended the third round strong with heavy strikes on top. I scored all three rounds for Martinez. After losing his UFC debut to Andre Soukhamthath, Martinez earned his first UFC win and said he is staying at bantamweight with his former weight class at flyweight too small for him. Turner looked excellent for the short time this fight lasted. Turner connected with a pair of right hooks, then attacked the body with a left kick and punch when Potter went down and ate more strikes before the stoppage. Potter was out of it afterward. All of Turner’s wins have been first-round stoppages. This was unbelievable for the time it lasted with a wild brawl. They were immediately throwing strikes everywhere with Ishihara landing a looping one. Kang rocked Ishihara with a right hand followed by a knee from the clinch that put Ishihara down to a knee. Kang continued with uppercuts from the clinch and then they threw caution to the wind and threw without any care. Kang got his back on the ground, Ishihara blatantly grabbed the fence, but Kang had the rear-naked choke secured and Ishihara went out rather than tap. Kang improves to 15-8 and said he will only win by submission or stoppage from now on after some split decision fights. Ishihara has lost 5 of his last 6 fights. Kara-France won the first round in part to two big overhand rights landing while circling Paiva and outstriking him. Paiva turned it around in the second round, he got side control after opening round with leg kicks. Paiva connected with a combination and applied a rolling guillotine as the round ended. The third was razor close, although I score it for Paiva. Paiva did well inside the pocket but kicked Kara-France low for a brief timeout. France scored a takedown in the closing seconds. Kara-France has won seven straight and improves to 19-7 with 1 no contest. This turned into a very entertaining fight. Young was patient early but throughout each round, he would pick apart at Arnett while absorbing jabs and then unload with flurries that Arnett ate with large volume combinations. Arnett was switching stances a lot earlier in the fight. In the third round, he landed several big uppercuts after Arnett absorbed one of his flurries. Arnett finally got his striking going in the closing seconds and then got knocked down by a right from Young. I scored it 30-27 for Young. Young improves to 13-4 and is his second consecutive win in the UFC after losing his promotional debut to Alexander Volkanovski. Ma had a fight-of-the-year contender in 2016 against Polo Reyes at UFC 199. After losing his first two UFC fights, he came into this fight winning his last three. Smith had won his last five and is coming off a 46-second win over Julian Erosa. Smith had solid footwork and was biding his time with Ma throughout the opening round. Ma threw a kick and left himself open for a left hand and right hook combination that stunned him. Smith continued with an uppercut and sent Ma to his knee and attacked with three huge strikes for the stoppage. Smith looked great in the fight and improves to 10-1 and is 2-0 in the UFC. He said he wants to fight Francisco Trinaldo next. After 16 fights with the UFC since 2014, this is Alvey’s first fight on pay-per-view. Crute dropped him with a solid right hand but then walked off assuming it was over and Alvey continued. Crute was taken down, got to Alvey’s back and started attacking with strikes and referee Marc Goddard stopped the fight. Alvey was furious with the stoppage, yelled at Goddard and stormed out of the cage after the decision was read. De La Rosa dominated the fight using her strikes to set up the takedowns. In the first round, she got top position with a takedown and controlled the round in half and full guard. In the second, De La Rosa got her down and went for a triangle armbar. Kassem defended but De La Rosa never let go of the triangle and eventually got the verbal submission. De La Rosa improves to 10-4 and this was the first loss of Kassem’s career. This was a solid fight as Simon continues to improve and scored a win over a ranked bantamweight. Simon and Yahya traded big right hands in the first round. Simon dropped Yahya and later connected with a left hook but wanted no part of Yahya’s ground game. They clashed heads in the second round and Simon had to deal with a cut by his right eye. Simon charged in and knocked down Yahya with his shoulder. In the third, Simon got a takedown and finally entered his guard in the final minute and landed some strikes to end the fight. I scored the fight for Simon 30-27. Simon has now won eight in a row and is 3-0 in the UFC. Vannata immediately slammed him to the mat with a body lock. Vannata spent the most inside his guard until opening with a pair of elbow strikes. He transitioned around Mariano’s body and took the arm and applied the kimura for the tap as the round was about to expire. This was Vannata’s first win since December 2016 following losses to David Teymur and Drakkar Klose. He challenged Jim Miller to fight this summer. This turned into a fun spectacle and Silva showed up and had a better performance than expected. Silva was wobbled in the first round as he chased after Adesanya and was caught. Adesanya landed a knee and started tagging Silva. You could see Silva was slower and didn’t have the same level of reflexes as before but was still hard to figure out for Adesanya at points. Silva had his best round in the second after eating a combination with his hands down. Silva landed with counter rights and then a great combination for his best moments of the fight. I had it 19-19 after two rounds. Adesanya attacked with leg kicks in the final round. Silva wanted to fight with his back to the fence but was eventually brought to the center. Adesanya attacked with his left hand and won the final round and fight. Adesanya said he came to work unlike others and the audience booed the veiled reference to Robert Whittaker. He compared Silva to Michael Jordan and told Kelvin Gastelum to put that belt down that he was carrying around. Silva said he would like to fight in Curitiba, Brazil.